With unrelenting zeal, I write to you again to renew our commitment to build a vibrant democracy for the young people to whom we have pledged our service. Today, we renew our call for radical citizenship as we witness the gradual weakening of the institutions that have been mandated to protect and nurture our democracy. The sense of order that liberates emanates from a shared commitment to principles and values – and not from blind adherence to the dictates of one entity. The regression in our democratic order that we see unravelling before us is the result of power exercised without principles and without a sense of accountability. At this point, this work of consolidating our democracy appears more herculean given the wanton disregard of the rule of law, evident in the quo warranto petition of the Solicitor General to the Supreme Court to declare the disqualification of the incumbent Chief Justice. The quo warranto is without basis in the Constitution, which unequivocally identifies impeachment as the only option to unseat the Chief Justice. As if the over-reach of the Solicitor General is not sufficient, the president himself declares the incumbent Chief Justice as his enemy. The pronouncement is a threat hurled at a co-equal official and does not augur well for a well-functioning democracy that relies on a system of check-and-balances. We are alarmed at these troubling behaviours by the Executive for it betrays a lack of respect for the integrity and independence of the Judiciary. 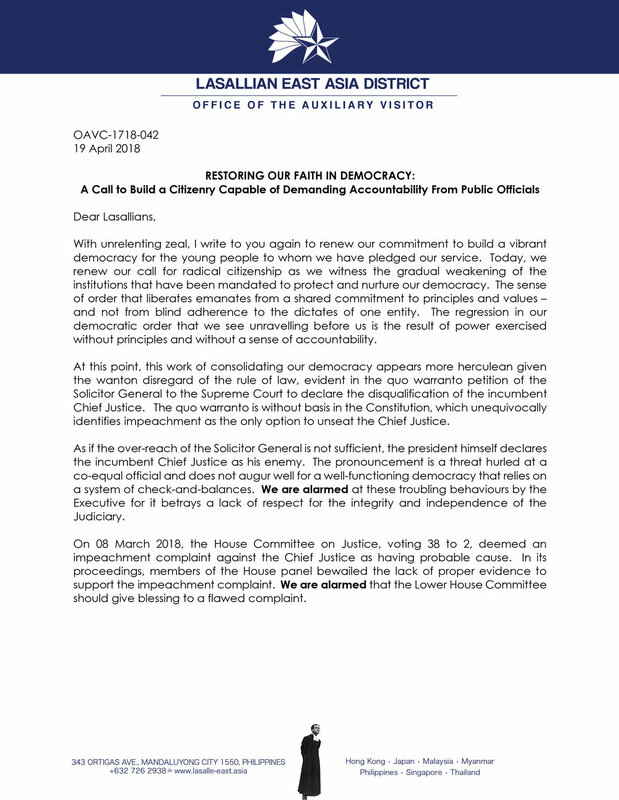 On 08 March 2018, the House Committee on Justice, voting 38 to 2, deemed an impeachment complaint against the Chief Justice as having probable cause. In its proceedings, members of the House panel bewailed the lack of proper evidence to support the impeachment complaint. We are alarmed that the Lower House Committee should give blessing to a flawed complaint. We are alarmed that in the wake of inquiries on the cases of extra-judicial killings in the purported war against drugs, the president has unilaterally decided to withdraw from the International Criminal Court (ICC). Recently, the president threatened a prosecutor of the ICC that she would be arrested should she visit the country. This is not the first time that the president has threatened an international official, having issued the same warning against a Rapporteur of the United Nations High Commissioner for Human Rights. Only this week, Sr. Patricia Fox NDS, an Australian missionary nun part of an international fact-finding and solidarity mission in Mindanao, was apprehended by Immigration officials and threatened with deportation. From our perspective, these threats are misplaced assertions of the country’s sovereignty. Ranged against the submissiveness of the president to China on our rightful sovereign claim on our territory in the West Philippine Sea, we are extremely befuddled with the president’s selective invocation of our country’s sovereignty. Amidst all these troubling developments, we reaffirm our commitment to take every step necessary to strengthen our democratic order, to restore our faith in democracy. Without doubt, not everyone in our community will share our perspective on the recent events in our country. As educators, it is not our intention to impose our views on others. It is however our duty to root those we instruct in the principles and values of democracy that will provide them with confidence to act for the common good. By these same principles and values, we are empowered to hold accountable those who claim to represent us. In this let us not be found wanting. In the end, it is not those opposed to our views that concern us. It is rather the indifference and silence of many that prove to be most destructive of democracy. The sense of powerlessness and political inefficacy breeds abuse. If there is a place where our battles have to be fought, it is in the hearts of those who have come to believe that they cannot do anything. When we do not do as much as raise a voice of protest over the abuse that we see, we unwittingly give up our faith in the ideals that provide us our moral compass and sense of integrity. We will not surrender. The weakness of our institutions does not merely result from the actions of incumbents who wittingly or unwittingly exceed the limits of their powers. The primary weakness of our institutions is that we, as a people, have effectively failed to hold those who claim to represent us truly accountable for their acts. To ensure genuine accountability, we must work towards strengthening persons in their commitment to the principles of a democratic way of life; and intensifying our effort to organize and empower autonomous groups that are ready to articulate their concerns before officials, at the local and national level, who must act within the bounds of law and respond effectively.